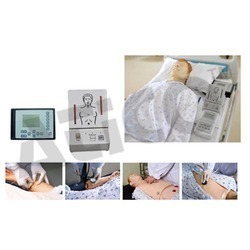 Vital signs simulator includes “Auscultation, ECG teaching special chest skin”, “Auscultation abdominal skin”, vital signs simulator, simulative electronic auscultator, DC9V external power adapter, etc. Holistic nursing care: sponge bath, replacing clothes, cold and heat therapy. Trauma evaluation and care: washing, disinfection, enswathing of the wound, hemostasis and bandaging. Blood pressure measurement and the carotid artery pulse. Facial burn: I, II, III degree. Opened clavicular fracture and contusion wound on the chest. The wound in abdomen with small intension evisceration. Opened fracture of right hand (including parenchyma aceration, fracture and bone tissue exposure). Burns in left forearm: I, II, III degree. Closed tibia fracture of right leg and contusion wounds in left ankle and foot. 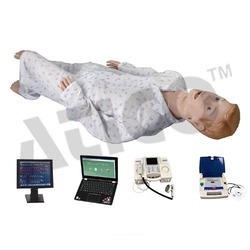 The system consists of a full-body male manikin, vital signs simulator, multi-parameters simulative monitor and computer. 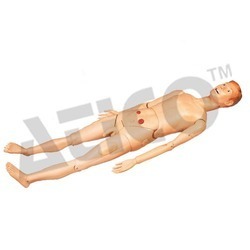 It can simulate basic nursing and advanced nursing, including non-invasive BP measurement, auscultation heart sound, respiration sound, bowel sound, pulse, BP, ECG and other vital signs functions; meanwhile, the system is suitable for hospitals, Medical Colleges, Health Schools and provide skills training for rural doctors, also provide CPR, external defibrillation and other emergency operation skills. The system can simulate virtual nursing cases and nursing skills training, features combination of text, auditory image and videos, operation log, save, assessment evaluation, result printing, interactive network. Its birth fills the gaps of national advanced nursing education field, marking our nursing education mode joins up with the developed countries. Hair washing and combing, face washing, ear irrigation and drops, mouth care, artificial teeth care, male/female urethral catheterization, male/female bladder irrigation etc. Trauma evaluation and care: washing, disinfection, enswathing of the wound, ;hemostasis and bandaging. 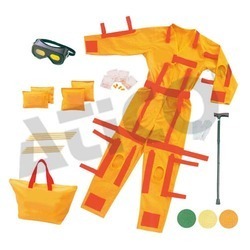 Be able to wear "Simulated Elderly Action Suit" to experience old people's ife and the aging feeling of the specific part of the body, and provides better understanding for old people's feeling. 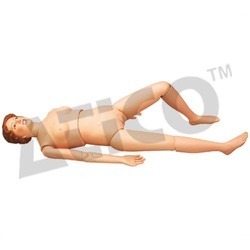 Looking for Nursing Manikin ?